If your goal is to create an iOS mobile profile to establish an openVPN connection on-demand using the iOS native VPN functionality, please read on! 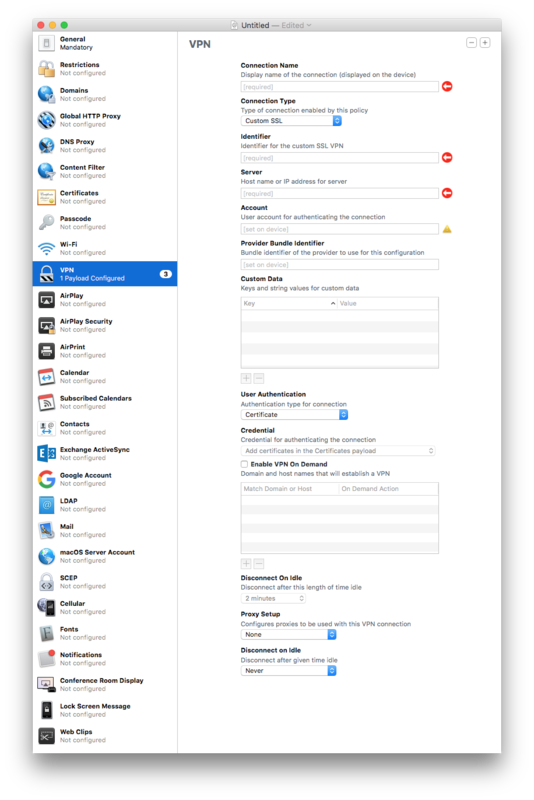 You can download Apple Configurator from the macOS App Store. It is currently available as version 2 for free. The openVPN profile should include everything required to correctly initiate a VPN connection from you iOS device. I highly encourage you to test the profile on iOS using OpenVPN Connect before attempting to convert it to an on-demand profile. Before we start working on the profile we need to create a pkcs12 bundle including the credentials required to authenticate with the openVPN connection. The on-demand profile does not allow the user to manually enter a username and password. This information needs to be included in the mobile profile. The above openssl command will create a pkcs12 bundle called iPhone.p12. The command will ask you for a password required to import the credentials. Launch Apple Configurator. Press [Command + N] on the Keyboard or select File -> New Profile from the menu. We need to fill out some of the sections outlined on the left hand side of the profile editor. Starting with General. You can enter anything you want really, just make sure to choose a unique identifier as installing profiles with the same identifier will overwrite the previously installed profile. You can not install multiple profiles that share an identifier on the same device. The next section we work on is certificates. Here you will insert your credentials to authenticate the connection. Insert the .p12 file here by clicking the + button in the top right. Enter the password from the openssl command in the respective field so that the credentials can be imported. Optionally include additional certificates useful or required after you established the VPN connection. In my case I included a host certificate to securely establish a TLS connection to a web server on the VPN. The Custom Data field needs to include all the information from the .ovpn file as key-value pairs. 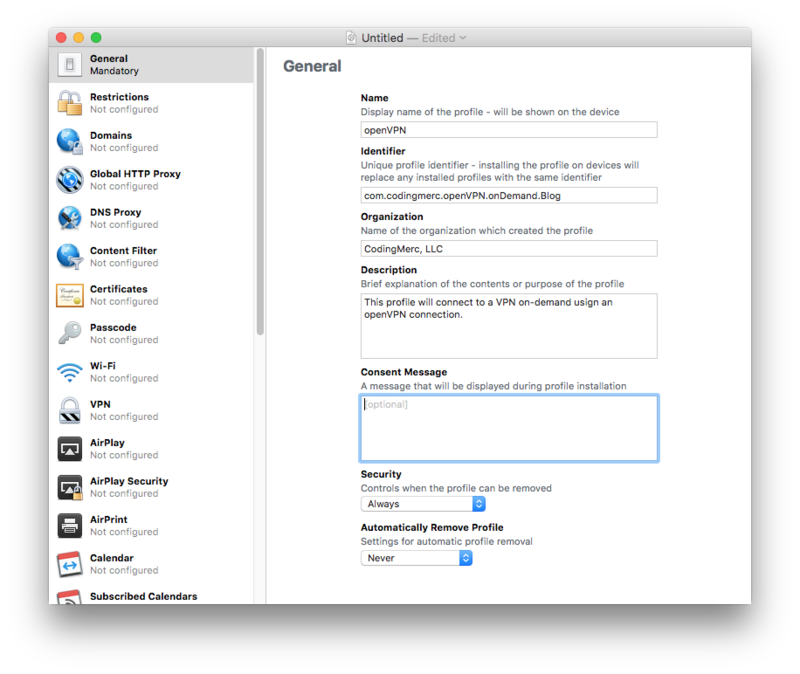 Open your openVPN profile with a text editor. The first option in each line needs to be added as the key, everything afterwards in the same line is added as value. If an option (like nobind or float) does not have a value argument, insert NOARGS as value! This sections must include pairs for the following keys if the server requires them: remote, ca, cert, key, tls-auth, key-direction, auth-user-pass, comp-lzo, cipher, auth, ns-cert-type and remote-cert-tls. Make sure to include the pair with key vpn-on-demand and value 1. Please consult the OpenVPN Connect iOS FAQ for more information on specific fields and troubleshooting. Save your created profile (do not sign it yet!) and open it using a text editor. It will look like a .plist XML file. Make sure that all certificates and information are in the correct format. I redacted my certificate information in the example above. Lets have a look at the OnDemandRules section of the file. Here you need configure a rule-set when you want your device to establish secure VPN connection on-demand using the openVPN profile included in the mobile configuration. If the phone is connected to the Wifi that belongs to my VPN network site I don’t want to connect on-demand. This connection is already considered secure. If the phone is connected to any other Wifi I need it to establish a VPN connection to my secure site. If the phone is connected via cellular only and not connected to a Wifi currently I need it to establish a VPN connection on-demand. If none of the rules above match, the VPN connection should be disconnected. I did not find an official documentation to all available rules and options. I was able to derive this basic set of information from the example iOS VPN On-Demand Rules found on Derman Enterprises blog. After you saved your rules set you can optionally sign your on-demand VPN connection mobile profile if you want and have a valid set of credentials. This will display the signing information along with the profiles information when the configuration is installed on the device. 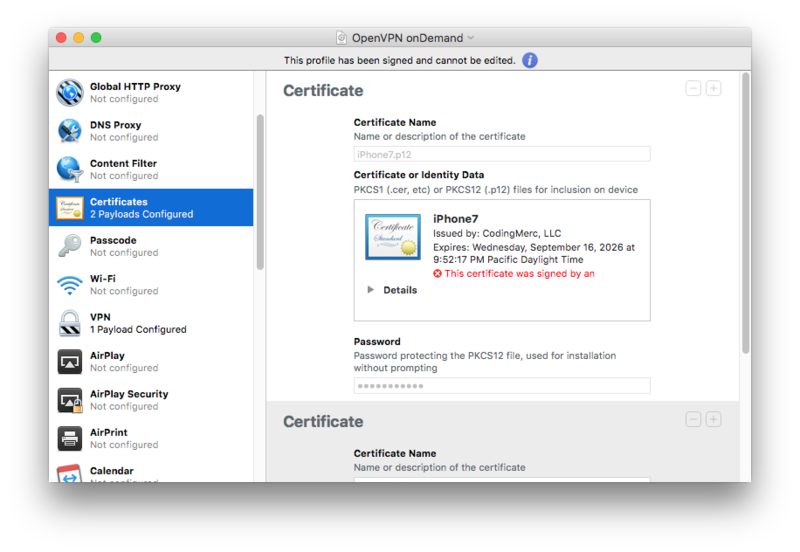 Just open the file in Apple Configurator again and choose File -> Sign Profile from the menu.